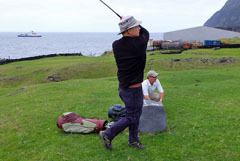 Tristan's golf course in Hottentot Fence offers an interesting challenge, with lots of interesting hazards. 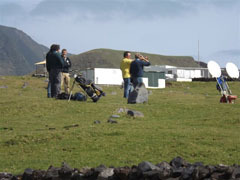 and is scattered with numerous volcanic boulders! 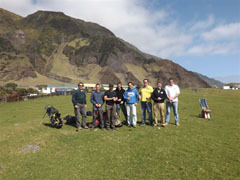 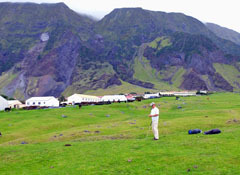 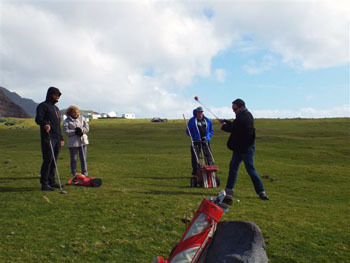 Robin Repetto manages the unique Hottentot Fence Tristan da Cunha Golf Course on behalf of the Tourism Department. 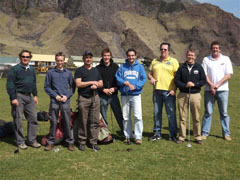 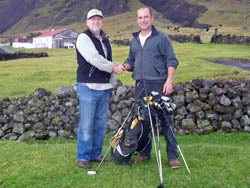 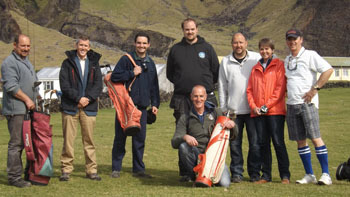 Robin is photographed left with visiting consultant Steven Catchpole who generously donated two new sets of golf clubs along with 10 pair of gloves, 1000 tees and 6 dozen new golf balls in May 2009. 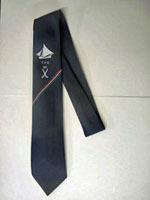 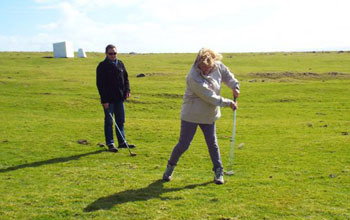 Tourism Coordinator Dawn Repetto (Robin's wife), can arrange a golf package for visitors which includes a famous Tristan Golf Club tie, golf certificate, score card and a play on the course for £20. 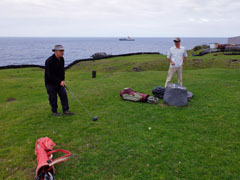 Hubert Launay and Andrew Finnimore. 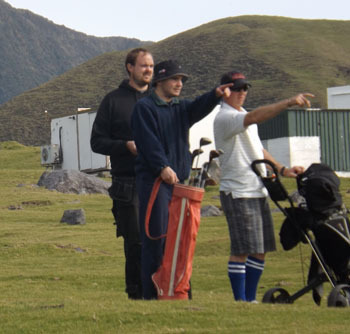 Factory Manager Erik MacKenzie scored 48 for the nine hole course and was declared the 2015 Open Champion. 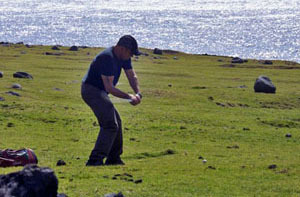 and rounded volcanic boulders which, if, hit, will project balls randomly, often into the sea! 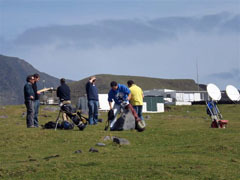 visible as white structures in the course photos above. 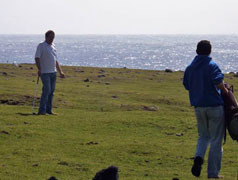 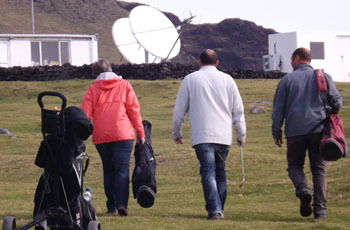 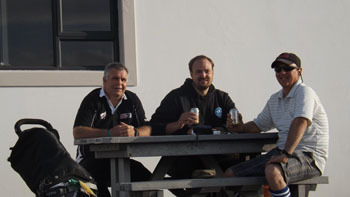 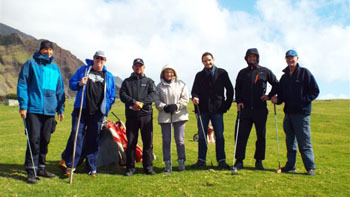 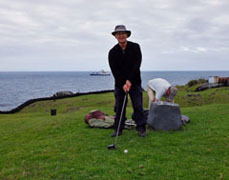 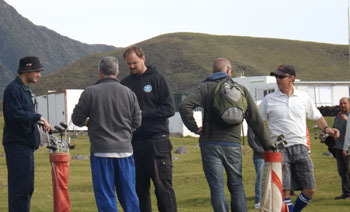 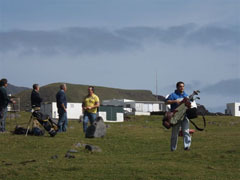 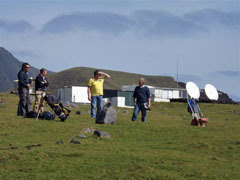 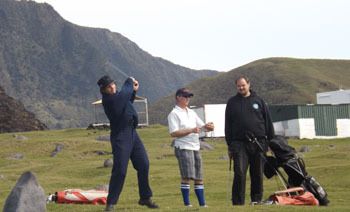 to allow Agulhas visitors to compete against local golf enthusiasts. 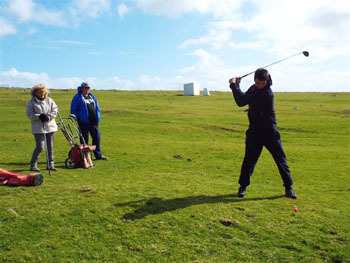 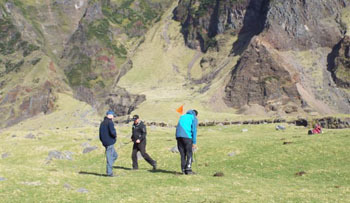 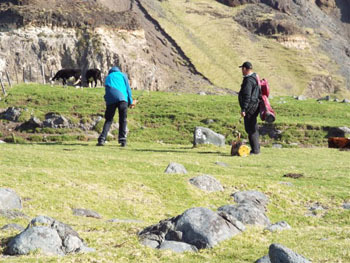 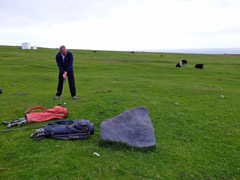 Scenes on the 1st tee (left) with John Bowker setting up his tee shot attempting to avoid the cows (left), John looking on as Drew Campbell makes his drive (Centre), and Drew contemplates his 2nd shot (right). 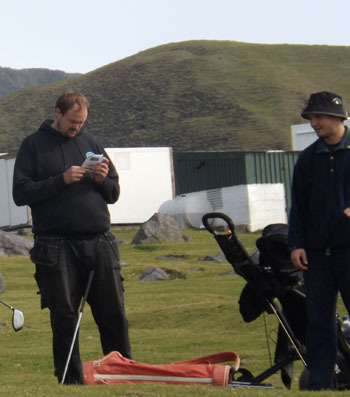 We invite Hywel, John and Drew (or others who have played the course) to contact us with images or anecdotes of their experience.